The entire lineup of rugged 2019 Toyota Tacoma pickups is now available at Lou Fusz Toyota, serving St. Charles, MO drivers. The new Tacoma trucks continue to offer stellar on-road and off-road capabilities as the models before it, but we even more advanced technology and powertrain features! From its suite of standard driver-assist systems to the available Crawl Control (CRAWL) that's like low-speed cruise control for off-road adventuring, the 2019 Tacoma is ready to deliver an unforgettable driving experience -- no matter where you drive! Get into a new Toyota Tacoma in St. Louis, MO when you visit Lou Fusz Toyota. Our entire new Toyota inventory is available online now, so don't hesitate to shop and compare our Tacoma trucks online or on-site! There are six trim levels available when you shop the 2019 Toyota Tacoma, ranging from the SR base trim to the premium Limited and off-road-ready TRD Pro model. 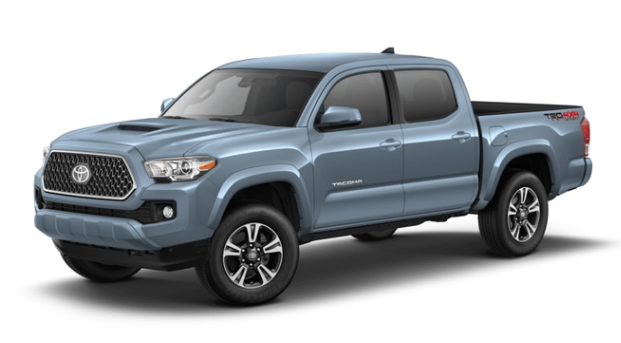 Every 2019 Tacoma boasts Toyota Safety Sense™ features like a pre-collision system and adaptive cruise control, while the popular TRD Off-Road model adds performance enhancements like an electronically locking rear differential. For an array of TRD performance parts on your new Tacoma, see the 2019 Tacoma TRD Pro, which comes equipped with TRD Pro cat-back exhaust, TRD-tuned high-performance FOX® 2.5 Internal Bypass shocks and a TRD Pro skid plate. Shop Lou Fusz Toyota today and locate your new Tacoma truck that comes with a ToyotaCare no-cost maintenance plan that can be utilized here at our service center. We invite St. Peters, MO area drivers to find out the value of their vehicle trade, apply for Toyota financing and more here on our website before visiting us for that test drive!